Ever since the U.S. withdrew its troops, Afghanistan's fragile democracy has increasingly come under pressure. Women, above all, have to continually fight for their hard-won rights. 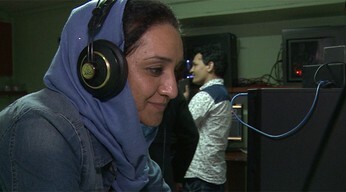 Over the course of four years, filmmaker Sedika Mojadidi has followed two extraordinary personalities: investigative TV journalist Shakila, who tries to bring corruption to light as well as Nilofar, member of parliament, who is constantly exposed to the hostility of her strictly conservative fellow politicians in her fight for fundamental women's rights. In an increasingly heated climate, both need to rethink how they can live without endangering their families – and themselves. FACING THE DRAGON offers unique insight into today's seething Afghanistan and explores the question of whether there is a future possible there for strong women.